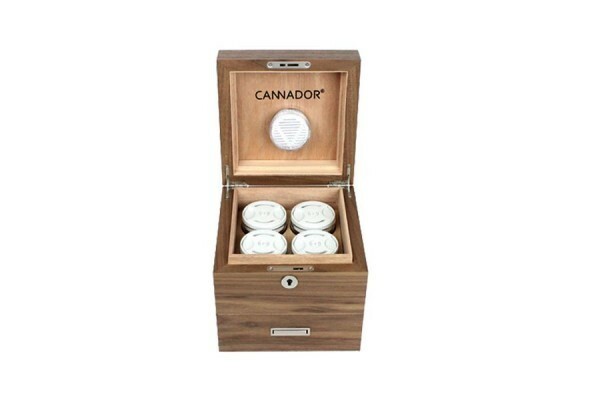 The 4-Strain Cannador® with drawer is great for someone who likes to keep up 28.34g with four different strains. Each removable glass cup can fit 7.08g (or up to 14.17g ground). Comes with 2 keys so you can safely secure your contents. With several layers of wood and a tight sealed beveled edge, you can rest easy that no smell will leak. A drawer for your accoutrements like your grinder and vape will comfortably fit underneath. Cherry is a lighter more blonde color and walnut is darker brown. The finish is a clear matte to give a more natural look and feel to the wood.